Last week it was spring here. The sun was shining! It was 60 degrees! The children were playing outside! The last stubborn snow bank finally melted! And it kept snowing. And we are all white and full of snow again. Nooooo!!!!!! 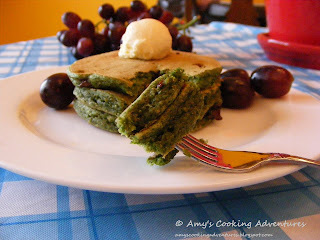 So to combat the anti-spring, I decided to make some nice green pancakes (it makes sense to me). I had originally planned to make these on St. Patrick’s Day, but my husband was less than thrilled about them, so I decided to make them when he was gone. 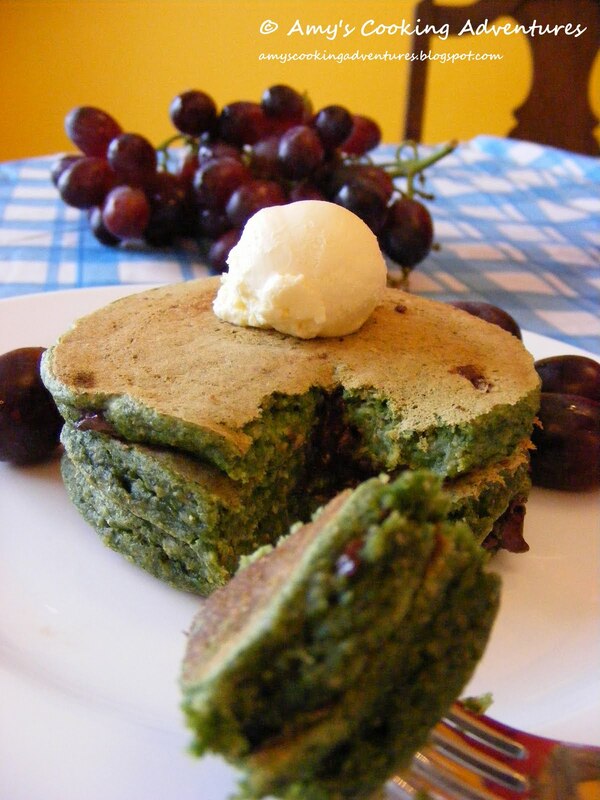 So, beautiful green pancakes. They have spinach in them, did you guess? Now here’s the surprising part: you can’t taste the spinach. Really! Between the spices and the chocolate chips, and spinach flavor is completely disguised! And yes, my little guy did eat these! Heat an electric skillet to 325 degrees F.
In a medium sized bowl, whisk together the flours, flax, baking powder, allspice, nutmeg, chocolate chips, and salt. In another bowl, whisk together the milk, honey, spinach puree, egg, and vanilla. Add the liquid ingredients to the dry ingredients, stirring until just combined. Spoon 2-3 tablespoons of pancake mixture onto the hot skillet. Cook for 2-3 minutes or until the tops begin to bubble and the bottoms are lightly browned. Flip and cook an additional 2 minutes until the other side is lightly brown. Serve with butter and a drizzle of syrup. I find it works best to use a 10 oz box of frozen spinach (this way the spinach is very well cooked). Simply cook the spinach in the microwave for the maximum time according to package instructions. Then place the cooked spinach and any liquid into a food processor and puree until very smooth, adding additional water if necessary. This yields about 1 cup of puree.